On August 30th, CatholicTV will air the Installation Mass of Archbishop Gregory Aymond. Archbishop Aymond will be installed as Archbishop of the Archdiocese of New Orleans on August 20th. He is the first New Orleans native named to head the Archdiocese of New Orleans in its 216-year history. Once broadcast on CatholicTV, the Installation Mass will be added to the CatholicTV.com archives and will be viewable in full-screen and free of charge. 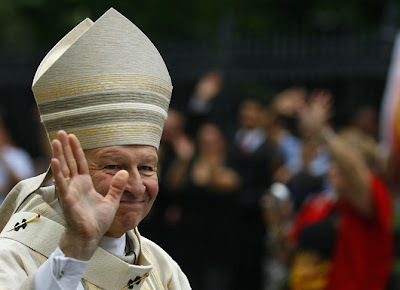 Aymond was Bishop of the Diocese of Austin, Texas before returning home to his new assignment. In a recent interview, Archbishop Aymond said, "Even as I returned to New Orleans for vacations and to visit family and friends, never in my wildest dreams did I ever think I would be back here as archbishop and doing ministry as the shepherd of this church, but I accept that responsibility knowing that I will depend on God and God's help. … I promise to stay close to the Lord in order that I can fulfill my episcopal ministry faithfully." The Diocese of Austin grew rapidly (partly as a result of immigration) during Aymond's bishopric and actually had more churchgoers than many archdioceses, including New Orleans after Hurricane Katrina. Archbishop Aymond is thought to be an effective recruiter of people to church vocations. The Austin Diocese web site indicated that during his nine years of leading the diocese the number of seminarians increased threefold. Archbishop Aymond is a pro-life supporter and "was one of more than 80 United States bishops who wrote to the University of Notre Dame (in South Bend, Indiana) to protest its award of an honorary degree to President Barack Obama". Archbishop Aymond's installation will air at CatholicTV.com and on CatholicTV on August 30th at 12:30PM and again at 8PM (EST). The installation will be viewable in the CatholicTV archives at http://www.catholictv.com/shows/default.aspx?seriesID=111 alongside the Installation of Masses of Archbishop Timothy Dolan, Archbishop George Lucas and several others.